Boro broke the Bristol City Ashton Gate hoodoo as they recorded a third straight league win. First half goals from Martin Braithwaite and Britt Assombalonga and an all round professional and proficient away performance meant that Boro recorded a 2-0 win and so stayed TOP OF THE LEAGUE. 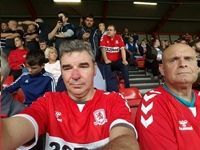 It was a long but joyous away trip to the south west for Boro fans, Ashton Gate so often a scene of defeat and disappointment was instead the venue for a solid 2-0 victory that kept Boro's early season momentum moving on forward. Tony Pulis might still be sticking to his warning message that we need reinforcements but as it stands the players in possession of team places are taking no prisoners as they keep on keeping on, picking up results and precious points. It was an early start for the 1000 away fans fighting to keep ahead of the holiday traffic that has made the M5 a car park over recent days and weeks. The reward was to see the team play so well in what has become a transformed stadium at Ashton Gate. Like the gentrified cafe bars area around the ground, the stadium itself has been upgraded into the 21st century and with fans bars, food kiosks and a band playing on a stage it is an attractive place for supporters to mingle before the game. Mind you the Bristol climate does help. It was sit where you want inside, which seems to be the policy every year here. Good for solo operators like me. And a grandstand view to see Boro taking the initiative early on. Darren Randolph punted a free kick the length of the field. City defenders failed to clear and the ball broke for Martin Braithwaite anticipating and running into space behind. The great Dane made it three goals in four league games, as he tucked it home, to set the Boro fans cheering an early lead. City sparkled briefly, as the lively Andy Weimann threatened to get on the end of several moves. When he did finally collect the ball in the box, he hit it high above the cross bar. The City defence continued to look very shaky but it was a smart Boro move that cut through them to make it 2-0. Ryan Shotton moved forward and rather than play the obvious ball out wide to Downing he threaded it straight through to Martin Braithwaite. The World Cup player quickly fed Downing giving him a free run up the flank. The former England winner, picked out for praise pre match by home manager Lee Johnson, flew forward cut inside, then out, before delivering the perfect centre which Assombalonga converted with his head. 2-0. Stewart Downing enjoyed a sparkling game, playing wide right he had the options of going outside and crossing or cutting inside as he did in the second half when only a full length save prevented him from scoring a result-clinching third. Braithwaite also had an opportunity to put the result beyond doubt and out of sight but when running in from the right he shot into the side netting rather across the keeper or squaring it into the box. Boro might have been made to pay for missed chances as Bristol City twice hit the frame of the goal in the closing minutes. Superb defending and athletic goalkeeping also thwarted the home team who continued to create but failed to find a cutting edge. In many ways it was the mirror performance to our first away game at Millwall. This time the home side had most of the possession as Boro were content to spring on the break. The only worry was that the result might also flip and City get two late, late goals to send us home very unhappy. But despite a few scrambles and a free kick striking the bar Boro held out well. Adam Clayton was throwing himself into challenges in the centre, Jonny Howson continued his turbo terrific start to the campaign by roaring forward from deep at every opportunity. At the final whistle we could all celebrate together. The long journey back seemed an awful lot easier to handle off the back of that third successive league win. An unbeaten start then and the team fighting for each other than the cause. Despite the loss of our star trio Boro continue to impress and are determined to stay on top of the League.